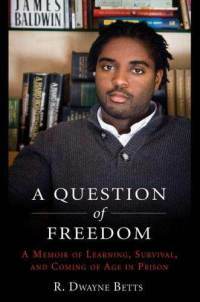 When you look at the cover of A Question of Freedom: A Memoir of Learning, Survival, and Coming of Age in Prison, (Avery, 2009) you see a picture of the author, R. Dwayne Betts. Most people would think that he was a smart, educated man. Which is what he is! Nobody would assume that he had once gone to prison, because his picture differs in so many ways from the stereotypical image of what a former prisoner looks like. And really, this is what his book is about: questioning what freedom means once you don't have it. A Question of Freedom is about how R. Dwayne Betts is sent to prison at the age of sixteen, and given a sentence of nine years. His crime was carjacking a man. A theme that keeps popping up in the book is thirty. How thirty minutes of "joyriding" landed him in jail. That thirty seconds it took to threaten the sleeping man whose car he stole. With a gun. And how much he regrets it. The book itself was well written and I think that it got Mr. Betts' message across. The book was more of a question about society than a book about prison, so if you don't like ethics and philosophy, this might not be a good read for you. The beginning and the end are where he really talked about his life, so those were the most "action-filled" parts of the book. The middle of the book talked a lot about how the author felt, having cellmates, each of a different ethnicity, being in isolation, or the cell, and being changed between prisons of different securities. The book kind of follows the style of describing an event, and then describing how he felt about it. One event that really stood out to me was when he started to learn Spanish so he could talk to his cellmates that spoke that language. He studied with a cellmate who spoke Spanish for about three hours a day until he could converse with his Spanish-speaking aquaintances. It was so touching that instead of lying there thinking about his doom, he feels the barrier between him and his cellmates: language. He says that prison is one of the most diverse places he's ever been. I found that interesting, the fact that it was so diverse that it could earn that title. While reading about Dwayne's cellmates' sentences, I was shocked. They had recieved HUGE sentences for crimes that, in my opinion, deserved at least a tiny bit less time. I was so intruiged about how it felt looking back at a crime. From the outside, people in prison look mean, like people that are always defined by what they did to get them there. But reading this book gave me a great perspective of how sorry people might be. And I think that the long sentence won't make you any sorrier. Sure, you need to be extreme to make sure they don't repeat themselves. But couldn't they have a person who worked with the prisoners, someone who gaged a sense of if they were ready for release? I don't know. Something. But reading this book made me a whole lot sorrier for the people, the teenagers, trapped behind those bars. As I said before, the book includes a lot of writing about what prison felt like, not the actual events of the prison. Personally, I felt myself starting to skim while reading the middle, because that was where Dwayne (the author) had done most of his explaining. Explaining, in the sense, that he was explaining an event and his feelings about it. It might appeal to sixteen-year-olds, because that was Dwayne's age when he first entered prison. They might be able to more easily relate to his thoughts then I could, being younger. It might also prevent teens from committing crimes like the one Dwayne did, because they would have a little bit of perspective of really having no question of being free, at least for a while if not their whole life. A Question of Freedom is a book written for adults, but I think if you are advanced enough to read it in your teens and you feel ready to read this kind of book, then you should. If you are under 14, I would advise checking with your parents about it first. If you do read it, I hope you enjoy the questions posed and really start to think about them. Think about a question of freedom.